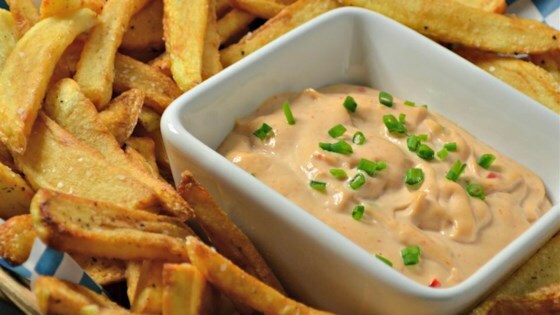 "Belgian fries are cooked twice for a soft middle and crisp outside and served with a mayo sauce called 'Andalouse' that can be best described as vaguely similar to Thousand Island dressing. The sauce makes a great chip dip or vegetable dip as well. We go through so much of it, I double it! My husband's family is Belgian, Flemish to be exact. I am told Flemish is equated with quality. This is a snack that is worth the time and effort! Since this is all about quality, be sure to use firm, fresh potatoes. Bring the sauce to room temperature before serving." Stir mayonnaise, tomato paste, red onion, green bell pepper, red bell pepper, lemon juice, and salt together in a bowl. Cover the Andalouse sauce with plastic wrap and refrigerate 8 hours to overnight. Heat oil in a deep-fryer or large saucepan to 300 degrees F (150 degrees C). Submerge potato strips in a bowl of ice water; rinse potatoes in several changes of cold water until water in the bowl is clear. Drain potatoes and pat dry. Working in batches, fry potatoes in the hot oil until just cooked through but still white, about 5 minutes. Transfer fries to a paper-towel lined plate to drain. Bring oil back to temperature between batches. Cool potatoes to room temperature, about 30 minutes. Increase oil temperature to 375 degrees F (190 degrees C). Working in batches, fry the potatoes again until deep golden, 5 to 10 minutes more. Transfer fries to a paper-towel lined plate to drain. Season fries with salt and serve with Andalouse sauce. Prepare the sauce the night before. It takes time for the flavors to meld. Allow the sauce to come to room temperature for serving. Fries can be cut and rinsed hours ahead of time and left in a bowl of cold water for use later in the day. Once fries have received their first fry they can sit for an hour at room temperature. This works well when trying to time dinner preparations! If your fryer doesn't have a temperature selector be sure to use a thermometer. Small batches are key, this allows the oil to keep a more even temperature. You can prepare the fries in a frying pan, just be sure to turn the potatoes and test the temperature.